Lab Supply is proud to supply our customers with a great selection of Clear H2O products for laboratory animals. In addition to the great medicinal and hydration supplements that we offer, we also provide a magnetic cup holder for these products that works great in metal cages. This magnetic cup holder allows you to serve your animals the Clear H2O products they need while keeping their bedding dry and their cages clean. 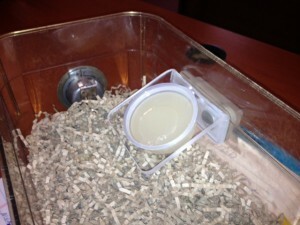 This cup holder simply uses magnets to attach to the side of the cage and secure the cup to prevent animals from spilling. It can also be autoclaved and reused over and over, making for convenient use. If you are interested in this great magnetic cup holder, then please click here to view the product in our online store. Here at Lab Supply, we are committed to making sure you find exactly what you are looking for. If you have any questions about this magnetic cup holder, then please click here to visit our contact page. We will be more than happy to answer any questions you may have.